EaseUS Todo Backup Server is server disaster recovery & system migration solutions for both physical and virtual Windows server environments. 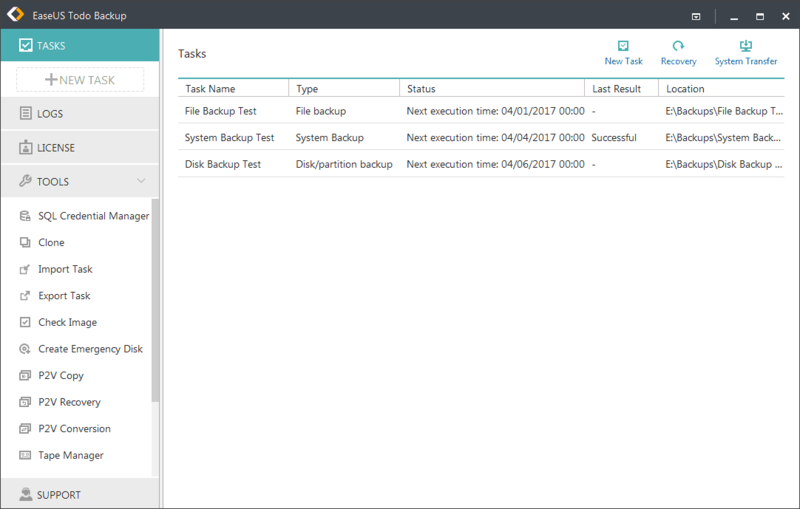 It provides enterprises with powerful backup & recovery features such as fast system & files backup, disaster recovery, advanced backup scheduler, differential & incremental backups and complete backup management tools. It simplifies server backup & recovery management while minimizing server downtime and ensuring business continuity.Main features:Server system backup and disaster recovery, including the OS and installed applications. File and folder backup & recovery, including network data.Clone, backup & restore of GPT disk.Remote backup and recovery management.Support P2V image files convert.One-click to restore system to dissimilar hardware.Differential/incremental Backup to save time and disk space. Backup schedule for automatical system & data backup.Automatically delete/overwrite old images. Backup options: image split, image compression, set priority, set password, email notification, etc.Clone or transfer hard disk to another.Explore Image files.Specify backup types like full, incremental or differential while manually execute task/plan in Management.Full NAS management.New features:Portugu�s and Polski languages supportedNew added mount and unmount featureImproved the performance of browsing filesFixed bug "Failed to restore to network location"Fixed bug "Empty folder generated after file type restore"Fixed bug "Outlook restore would skip the folder when restoring again after cancelling"Fixed bug "Windows Vista and later OS cannot proceed the backup trigged by shutdown"